The Skinny: The final, zany chapter of Sonny Chiba's Street Fighter series and quite possibly the best. 1974's The Street Fighter introduced audiences to a tough-as-nails Japanese mercenary named Takuma "Terry" Tsurugi (Sonny Chiba). With its over-the-top violence and charismatic lead actor, the film proved popular enough to spawn two official sequels in the same year and earn a devoted cult following upon its U.S. release (with Quentin Tarantino as one of its most famous fans). Though most sequels tend to be inferior to the originals, the Street Fighter series is one of the rare exceptions where each succeeding film improves upon the lastat least in terms of entertainment value, but not necessarily in terms of plot. Whether a person would agree with such a claim could probably be measured by how they react to the film's snappy pre-credit sequence. During these scenes, the hero's face remains hidden behind a Mission:Impossible-style human mask he wears. After saving a mobster during this sequence, the grateful man asks Tsurugi to identify himself. In a gloriously cheesy moment, Terry rips off his latex disguise, flashes a winning smile, and quips, "Terry Tsurugi's my name, but some people call me the Street Fighter!" The film suddenly freeze-frames on Chiba's toothy grin as the title card appears, accompanied by the film's funky Lalo Schifrin-inspired theme song! If you find that sort of overt goofball campiness endearing then this movie's definitely for you. The paper-thin plot of The Street Fighter's Last Revenge centers on the frantic search for an elusive heroin formula. Complicating matters, the secret recipe is hidden on two tapes that must be played simultaneously in order to be understood. An elderly Yakuza boss named Owata and a crooked District Attorney are both vying for the tapes with our man Tsurugi caught right in the middle. Of course, the tapes change hands numerous times during the the film, and Tsurugi meets a couple of femme fatales along the way. The definite bad girl of the film is the mob boss's sexpot sister Aya, who'll do just about anything (or anyone) to achieve her villainous aims. In contrast, the "bad girl with the heart of gold" award goes to Sue Shiomi's unnamed character, a Mandarin jacket-garbed spitfire who works for the crooked D.A., but secretly wishes to be on the side of good. However, her good girl status doesn't extend to her vocabulary; at one point, she says, "What I'd like to do right now is cut your goddamn balls off and then send them to you for a birthday present!" Such is the madcap world of The Street Fighter's Last Revenge. The wacky hijinks continue as Tsurugi faces off with the film's main antagonist, the evil District Attorney. Before their duel at an abandoned amusement park, the not-so intimidating D.A. begins a hilarious warm-up exercise that involves some absurd chicken-dance movements and some unnecessarily heavy breathing. Despite the sheer silliness of his repertoire, the D.A. is able to knock Tsurugi into a pool and get away. In keeping with the series' roots, Tsurugi seeks answers about his foe's perplexing kata at the dojo of diminutive sensei (and series regular) Masaoka (Masafumi Suzuki). Tsurugi then demonstrates the bizarre style to Masaoka with unintentionally comic results. And just like he does in the two films prior to this one, Tsurugi slips into an obligatory flashback to his father's WWII-era death in order to gather his strength. Naturally, many more asses get kicked for the remainder of the picture, which concludes on a literally explosive, yet surprisingly poignant note. While the film may lack the shock value of the original Street Fighter, it more than makes up for it by polishing up the Terry Tsurugi character. 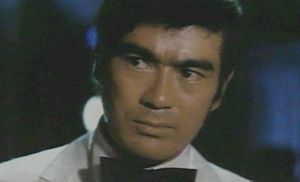 Just as Goldfinger, the third film in the 007 canon, solidified all the well-known trademarks of the James Bond persona, so too does this second sequel demonstrate the further evolution of Terry Tsurugi. Here, Tsurugi is no longer the oafish caveman he once was, but is instead now a far more likeable, but still deadly, protagonist. In many ways, Tsurugi is very much a James Bond-type figure in this film, at one point even donning a white tux to rendezvous with Aya. But then again, Tsurugi isn't exactly a Bond clone. I don't seem to remember 007 ever dressing up as a vampire in public. Yes, that really happens in this movie. And no, it really doesn't have any logical connection to the plot. New Line Cinema lists Shigehiro Ozama as director in the film's opening credits, while most other sources cite Teruo Ishii.